It’s a situation far too common for most Americans. You’re sitting in bumper-to-bumper traffic on the highway, again. Hundreds of cars are idling around you. It’s a typical, backed-up commute to work. Frustrated, you might wonder: How did we get here? It wasn’t an accident. Our congested commutes are the result of decisions that stretch back decades, to when Americans began to build their communities around cars. Today, the ways in which we plan and invest in transportation continue to contribute to problems like congestion, lack of accessibleand affordable transportation options, and a sprawling, unsafe, and ecologically destructive built environment. Behind many of these challenges lies a measure familiar to transportation planners and engineers: “level of service,” or LOS. This seemingly innocuous statistic, however, is one of the biggest reasons we’re literally and figuratively stuck in traffic—and it signals a need for a new way to guide our future plans and investments. WHY SHOULD WE CARE ABOUT LEVELS OF SERVICE (LOS)? In 1965, a group of engineers behind the Highway Capacity Manual created and coined a measure in the guide to reflect the quality of a driver’s experience on a highway facility, which it called level of service. LOS assigns roads a grade (A-F) based on several possible factors, including: speed and travel time; traffic interruptions; freedom to maneuver; and the capital costs to operate the road. In essence, LOS measures traffic congestion. Transportation analysts use those grades to judge roadway segments, specific intersections, and even entire urban areas (see the well-known TTI and Inrix reports). The irony of the LOS system is that it hasn’t solved congestion at all. In fact, it’s just the opposite: LOS keeps making traffic worse. The fundamental reason is that state and local governments often only view new or wider roads as the right intervention to improve LOS. Major urban road mileage rose by 77 percent from 1980 to 2014 (a total of 169,153 lane miles), compared to 41 percent growth in U.S. population. As the number of lane miles grew, urban residents drove more, and vehicle miles traveled (VMT) on major urban roads grew by 146 percent over the same period. This phenomenon is best explained by the concept of “induced traffic,” which states that more roadways just means more miles traveled via car. Not only does all that LOS-inspired construction fail to solve congestion, it actually helps create other sets of challenges. Urban highways cut through and separate communities, incentivize sprawling development, and over decades have contributed to the hollowing out of urban neighborhoods. Wide roads encourage high speeds, making corridors unsafe, and simply unpleasant, for pedestrians and bike riders while reducing overall quality of place. Finally, because only a few hours of peak use determine LOS, state and local governments build roads that are underutilized most hours of the day, and cost more to maintain in the long run. The country needs new performance measures to prioritize broader community goals around accessibility, economic development, sustainability, and livability. In short, the auto-centric development LOS makes possible has become one of the greatest obstacles to transportation choice and access, economic agglomeration, and environmental resilience. Atlanta, which has been rated as one of the nation’s most congested and least pedestrian-friendly regions, helps illustrate the negative effects that LOS can have on a city. 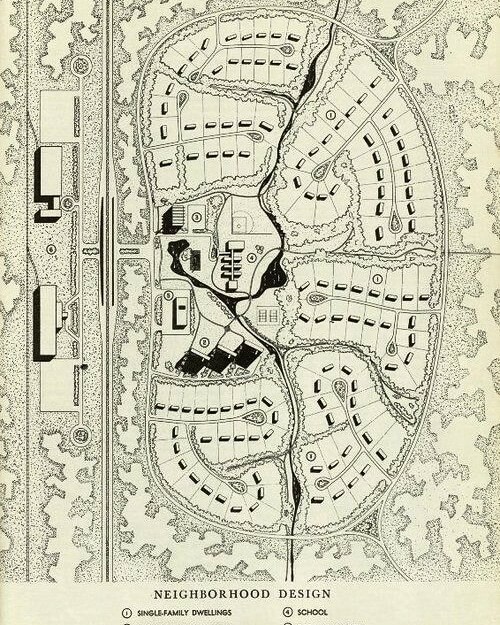 Much of Atlanta’s current design comes from a 1952 regional plan, which promoted the development of low-density neighborhoods. These low-density communities drew people farther away from the city center and led to growing traffic, spurring officials to build connecting interstate highways and other multilane roads for suburban workers trying to reach downtown jobs. More interstates and driving meant that Atlanta needed more parking lots, pushing businesses and housing further apart. As a result, from 1990 to 2010, Atlanta’s core urban area expanded from 1,137 to 2,645 square miles, more than doubling in size in just two decades. Atlanta’s expansion comes with a bevy of unintended consequences. For example, even as the region has been adding jobs over the past decade, typical residents have been concurrently seeing a decline in the number of proximate jobs. By distance, typical residents in the Atlanta metro area also now face one of the longest commutes, traveling 12.8 miles to get to work. In addition to the health risks associated with increased hours behind the wheel, even the air quality in Atlanta is worse off. Facing the consequences of its expansion, Atlanta is now trying to rein in its sprawl, but escaping the cycle of congestion, road construction, and car-centric suburbanization is not easy. Cities and states rely heavily on LOS for a reason. Congestion is a problem, and so it makes sense to have a performance metric that reflects our desire to eliminate it. But it also isn’t our only problem. The country needs new performance measures to prioritize broader community goals around accessibility, economic development, sustainability, and livability. Decreasing reliance on LOS also means introducing measures that don’t lead with transportation use, but instead with measures related to economic, social, and environmental outcomes. That starts with replacing LOS as a first-order priority. Some states are already doing this, including California. Some cities are excitedly turning to “multi-modal level of service,” a measure which reflects the needs of bikers and pedestrians, despite thorny barriers to implementation. Other cities like Los Angeles are replacing LOS with VMT, effectively aiming to limit increases in driving associated with new development. Finally, we also need to get a better handle on transportation demand. LOS pushes us to measure traffic through the lens of transportation supply, including where we build roads, bus lines, and bike lanes. Yet the introduction of new transportation technologies and the explosion of new transportation demand data allow us to know how people are getting to key destinations. Using actual and synthetic measures of travel activity, we can better understand how decades of roadway growth influenced people’s travel demands today—and then test how other place-based designs could lead to more efficient, equitable, and sustainable behavior. Using actual and synthetic measures of travel activity, we can better understand how decades of roadway growth influenced people’s travel demands today. For the busiest metro areas in the country—and their peers around the world—there’s no easy solution to bumper-to-bumper traffic. But if we start to measure our cities and suburbs differently, we can design solutions that ultimately create better places for people, not just their cars.